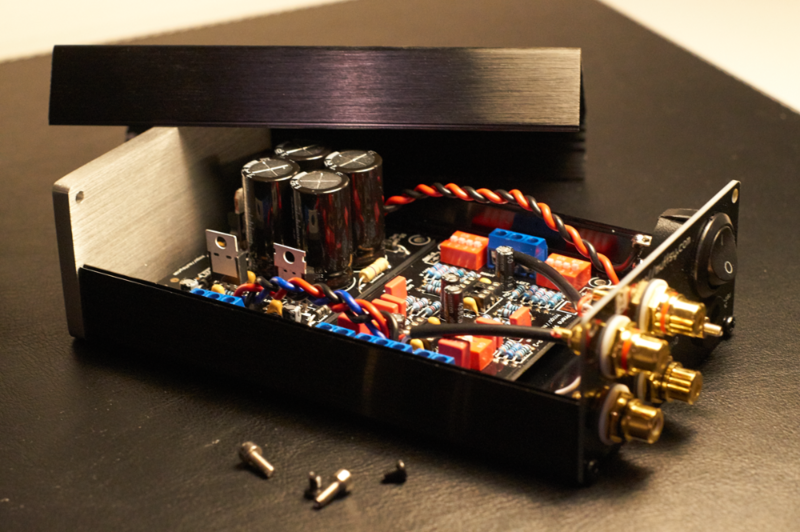 Over five hundred Muffsy Phono Preamps have been successfully built, which is a good testament to the reliability of the kit. Problems can arise, and here are some useful tips on how to identify any mistakes. Pay special attention to all cable connections and double-check that they are correct. Make sure that the phono connectors don't have any shims on the inside of the back panel. There are ground connections on the inside of the back panel that connect all the RCA connectors and the ground screw. Make sure that the AC power cabling goes in an arc over the input connector, as shown in the picture below. 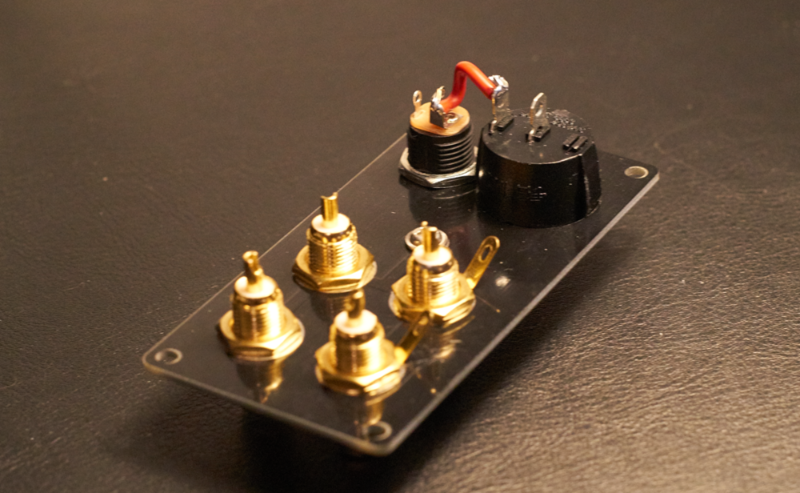 This is to prevent AC noise from entering the inputs. Set the multimeter to "Volts AC", you should expect something between 15-20V AC. Set the multimeter to "Volts DC", you should expect anything between 35-50V DC on the 4.7 ohm resistors outputs. Set the multimeter to "Volts DC". You should expect to be relatively close to +15V DC and -15V DC on the two outputs. The voltages on the input and at the voltage doubler can vary quite a bit depending on your AC adapter and the power that comes out of your mains socket. The voltages on the output should be relatively close to +/-15V DC. 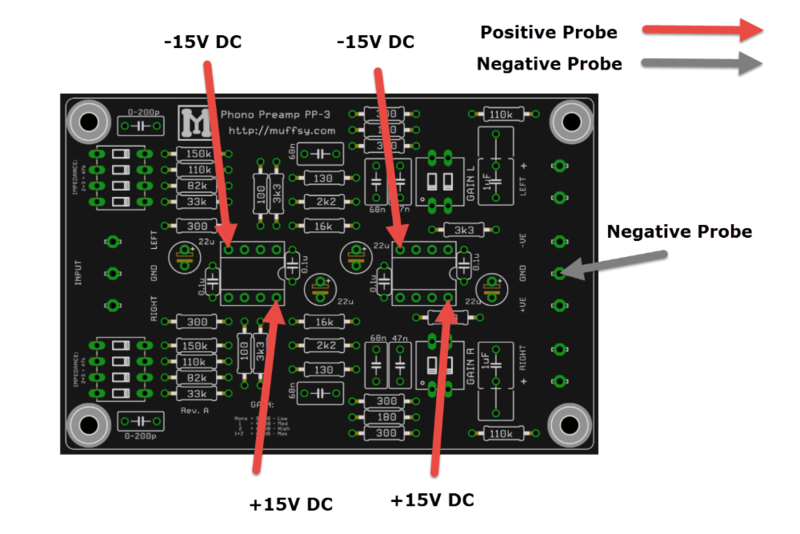 It can vary between 14.8 and 15.2V, which is because the regulator resistors aren't matched. This is no problem though, the op amps needs to swing between -10V and +10V at the very most. Bring out your multimeter, set it to Volts DC, and perform the tests below. The red arrow is the positive probe, the gray arrow is the negative probe. If the tests are correct, turn off the power and mount the op amps. Make sure that the orientation is correct. 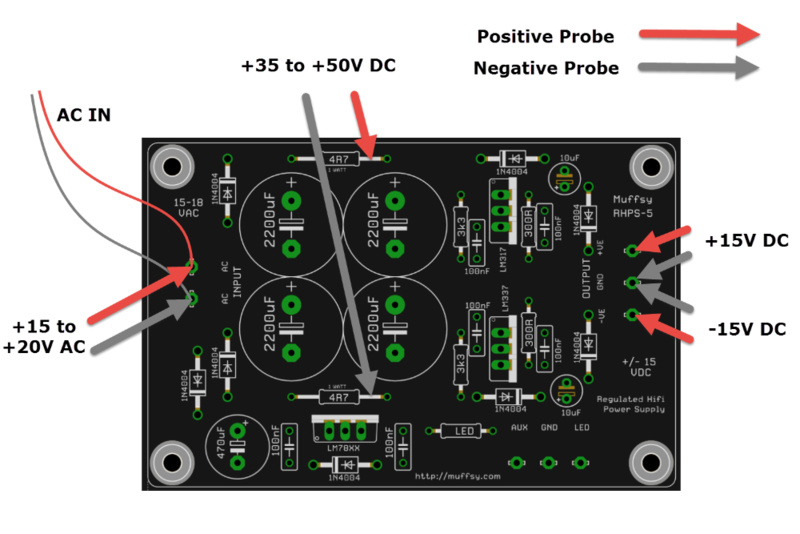 If the power supply connections have been connected in the wrong way (wrong polarity, or connected to the signal output), the operational amplifiers can break. An awfull burr/motorboat noise or a squealing noise are good indications of this. To complete the troubleshooting, you may have to spend some time going back to the build instructions and checking each step carefully.